Home » Posts » Attentionology for K-5 Teachers » Decorate An Attentionology Tree – Countdown to the Holidays! 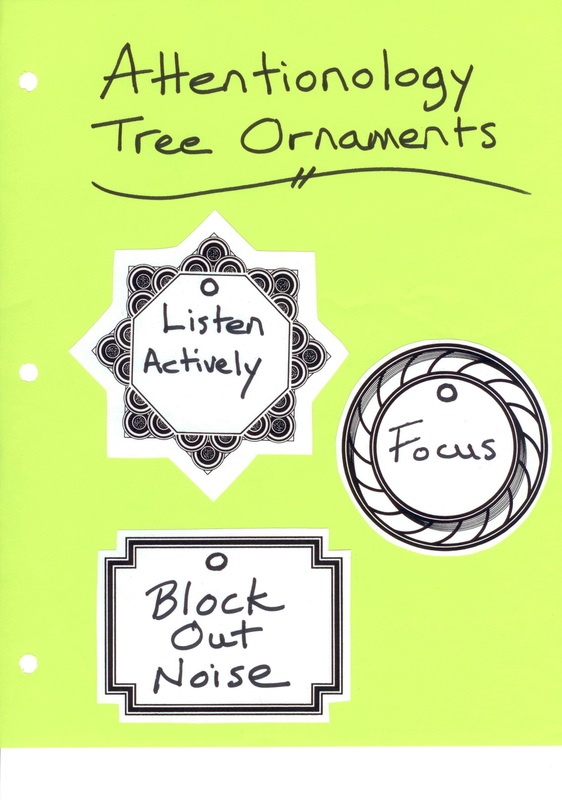 Countdown to the holidays with an Attentionology Tree that includes numbers and ornaments with Attentionology Tips for staying focused and on task in class. …Countdown to the holidays by decorating an Attentionology Tree. Make this a class project. Invite students to help you countdown to the holidays in this new and special way. 1. Announce your plan ahead of the day you begin decorating your Attentionology Tree. 2. Bring in a tree – artificial or real or turn a bulletin board into a giant tree using colored construction paper for the trunk and leaves. 3. Ask students if they feel more distracted than usual during the holiday season. 4. Discuss the importance of staying focused and on task in class, especially during exciting times of the year when distractions increase. Talk about the impact of distractions, how they can get in the way of getting basic, good work done. 5. Make a list on the board of your own and students’ ideas about HOW to make ourselves pay attention when we need to do so. 7. Distribute pre-cut paper shapes or invite students to cut and color paper shapes from colored construction paper to make ornaments and numbers to hang on the tree. Invite students to cut and color ornaments with Attentionology Tips on them to hang on the Attentionology Tree. 8. Instruct the kids to write ONE way on each ornament to stay focused in class. Call the strategies Attentionology Tips. 9. Help students punch holes at the top of the ornaments and numbers. 10. Tie ribbons to make loops for hanging the ornaments and numbers. 11. 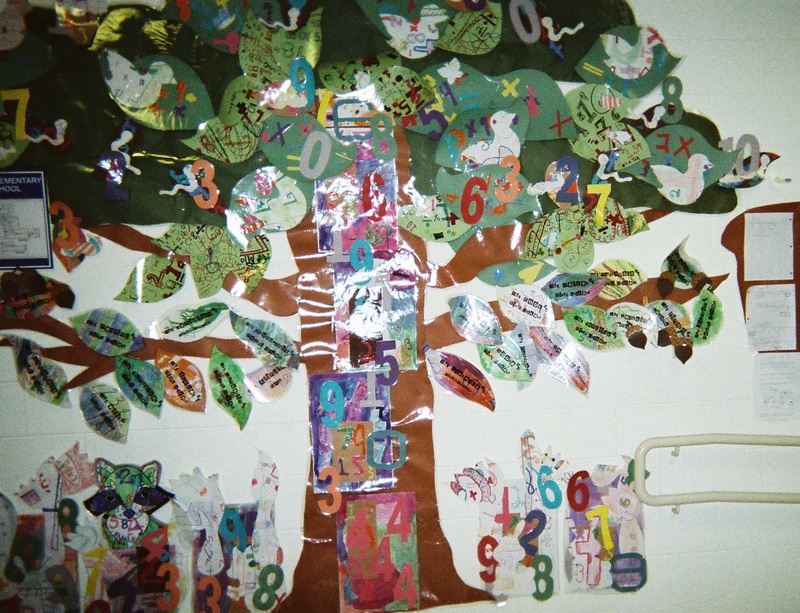 Invite a different student each day to hang one Attentionology Ornament at a time on the Attentionology Tree to countdown to the holidays. 12. 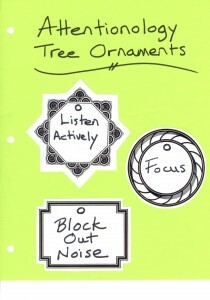 Just before vacation, review the Attentionology Tips on the tree ornaments with the class. Optional: Give students small Attentionology Gifts, such as plastic star ornaments, to reward them for their work and help them remember the Attentionology Tips. Leave the Attentionology Tree up over the holidays so that you can point to it as a reminder when class is back in session after the new year begins. Stop back by on Wednesday for Mid-Week Focus.